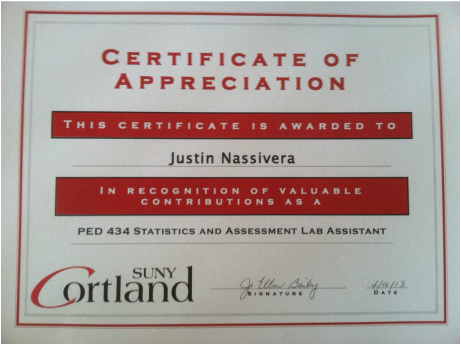 Reflection: These artifacts are my certificates for being a teacher's assistant for PED 356 Adapted Physical Education and Sport and PED 434 Statistics and Assessment in Physical Education. This was a great experience for me to grow as a professional. In PED 356 I was able to provide feedback to students by evaluating lesson plans. It was also a great opportunity to work with my professor and the graduate assistant. For PED 434, I got to evaluate students when they presented and taught in class. I also got to teach parts of the lab as well. I learned a lot about being responsible by making sure lesson plans were handed back in time for them to make changes before teaching. Being a TA showed me how crucial it is to give specific and valuable feedback to students to help them succeed.